Between the industrial horror of the Bacton gas terminal and the caravan park lunacy of Hemsby and Yarmouth, the east Norfolk coast has a number of lonely spots that border on prettiness. The most striking thing about this area compared with the north Norfolk coast is quite how flat it is, and the barley fields go right up to the sea wall in places, virtually ignoring it. Of course, the sea is gradually eating away here, as it is all down the east coast, and the policy of managed retreat means that some places will be lost to the sea, most noticeably neighbouring Happisburgh in the next half century or so. But this is nothing new; it has always been happening. Eccles village survived into the 18th century. Today, the coastline here is in Hempstead parish. But Eccles is still remembered, not least for its church. 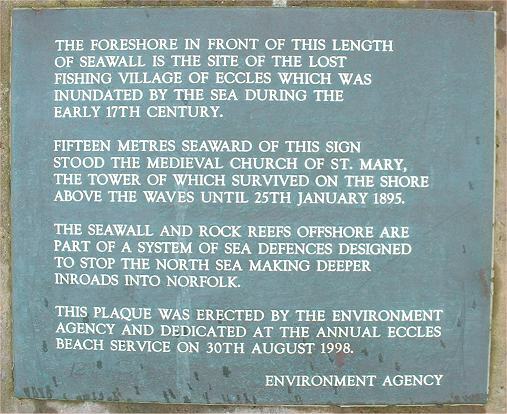 In 2001, the Archaeological Field Unit published an article entitled Sand, Sea and Sherds: Intertidal Archaeology on the East Norfolk Coast by Tim Pestell: "...as the sea advanced, chewing ever more land away, the sand dunes were pushed back around the church. When Ladbroke engraved the tower for his series of illustrations of the churches of Norfolk in 1823, the tower was still, just, on the landward side of the dunes. By 1893, the church was not only on the beach, the chancel ruins had been destroyed... The fact that the tower stood until 1895 and formed such a local landmark, made it an attraction for early photographers and so we have a number of early plates, most notably the fine image taken by a Mr Fitt, a Norwich photographer c.1890, and which was reproduced and sold in some numbers by him after the tower fell. ...it has been possible to show that the parish church was originally a two-celled building which had a round west tower... and a south aisle subsequently added. The tower is difficult to date, but from its size, proportions and coursed flint walling, appears to be Norman in date, probably of the twelfth century. " There are a number of these photographs on the Norfolk County Council archives website. Frustratingly, they don't give permission for them to be reproduced freely by not-for-profit websites like this one. I could just slice off the copyright and pretend I found them at a car boot sale, but I've decided to reproduce them as they are, and if Norfolk County Council are really displeased at your opportunity to see them, then no doubt they will come round my house with a couple of big blokes, a German Shepherd dog and a baseball bat to tell me so. Until then, you can see them by clicking on the first image below. The other images are Chris Harrison's photo of the memorial plaque on the sea wall, used with permission, and two from Hempstead church, one showing a newspaper article about Eccles, the other an archeological display of items found in the area of the former village. In the 1960s, Pevsner could still report that the location of the church was obvious from two large piles of flint. But they are all gone today.